Simulation studies have been the predominant method of evaluating ad hoc routing algorithms. Despite their wide use and merits, simulations are generally time consuming. Furthermore, several prominent ad hoc simulations report inconsistent and unrepeatable results. We, therefore, argue that simulation-based evaluation of ad hoc routing protocols should be complemented with mathematical verification and comparison. In this paper, we propose a performance evaluation framework that can be used to model two key performance metrics of an ad hoc routing algorithm, namely, routing overhead and route optimality. We also evaluate derivatives of the two metrics, namely, total energy consumption and route discovery latency. Using the proposed framework, we evaluate the performance of four prominent ad hoc routing algorithms: DSDV, DSR, AODV-LL, and Gossiping. We show that the modeled metrics not only allow unbiased performance comparison but also provide interesting insight about the impact of different parameters on the behavior of these protocols. Since the inception of MANETs and sensor networks, a number of routing protocols have been proposed to efficiently discover and maintain paths in an ad hoc network [1–6]. Due to lack of infrastructure and resources required to set up an ad hoc network, most of the routing protocols are evaluated and compared using network simulators. While simulations offer the flexibility to code and evaluate complex algorithmic logic, recent studies have shown that many ad hoc simulations report inconsistent, unrepeatable, or incomplete simulation results . Furthermore, scalability experiments even with thousands of nodes quickly become infeasible due to extremely time-consuming nature of network simulations. Therefore, we argue that simulation-based evaluation should be complemented with mathematical modeling of key performance parameters of ad hoc routing protocols. Such an approach will allow unbiased and provable performance comparison of the routing protocol even on very large-scale networks. Moreover, an analytical approach will allow researchers to analyze the strengths and weaknesses of a protocol at an early design stage. In this context, this paper proposes a performance evaluation framework to model the two most widely-used performance metrics of wireless ad hoc routing algorithms , namely, routing overhead and route optimality. We derive generic expressions to model the routing overhead incurred during the route discovery process. We also incorporate MAC-layer channel contention and SNR-based physical and link-layer channel error effects in the proposed modeling framework. For the route optimality model, we provide generic expressions to find the probability of optimal and suboptimal route discoveries for single as well as multipath routing protocols. We also model the expected probability of route establishment. Routing overhead and route optimality are the two baseline metrics and several other performance metrics may be derived from them. To illustrate the derivation process, we provide simple expressions for the following two metrics: total energy consumption and route discovery latency. The derived metrics in the proposed framework are parameterized such that they can be adapted to specific ad hoc routing protocols. As a proof-of-concept, we use the proposed framework to model and compare four prominent ad hoc routing protocols: DSDV, DSR, AODV-LL (AODV-LL is a variant of AODV protocol  proposed in  that uses link-layer feedback to avoid the use of HELLO messages to detect link failures), and Gossiping. To study the effect of modeling assumptions on the evaluated routing metrics, we also compare the analytical results with the results reported in an independently-conducted simulation study  and show that our modeling assumptions do not have a significant effect on the results. Finally, the proposed analytical models of routing protocols also yield interesting insight about the impact of different parameters on the performance of these protocols. The rest of this paper is organized as follows. Section 2 summarizes the previous work in this area. Section 3 outlines system description, modeling assumptions, and definitions of the key terms. The generic routing overhead model is developed in Section 4 along with the adaptation of model to specific protocols. Section 5 derives a model of route optimality in general and its application to specific ad hoc routing protocols. The use of the proposed models in mobile ad hoc networks is discussed in Section 6. The derivatives of routing overhead and route optimality are described in Section 7. We summarize key conclusions of this work in Section 8. To counter the inherently unreliable nature of ad hoc networks, Tsirigos and Haas propose a routing scheme that makes use of multiple simultaneous paths . With the addition of an overhead to each packet, the authors fragment the resulting unit into multiple blocks and route each one of them through a distinct path. The authors then study the probability of reconstructing the original information at the destination and show analytically that packet dropping probability decreases with an increase in the number of used paths. The authors then extend their work in  by relaxing the restrictions, for example, independent or disjoint paths, identical path failure probability. More specifically, the authors propose an approximation technique for selecting an optimal path set to maximize the probability of successful transmission in cases where paths may not be independent and their failure probability can vary as well. Santivanez et al. did scalability analysis of a number of ad hoc routing algorithms. The authors defined a scalability factor of routing protocol in terms of its total overhead and minimum traffic load. They showed that Plain Flooding (PF) algorithm scales better in high-mobility scenarios while Hazy-Sighted Link State (HSLS)  scales with the size of the network. Zhou and Abouzeid derive expressions for minimum length of control packets exchanged by cluster-based proactive ad hoc routing protocols . The authors also provide scalability analysis of routing overhead with respect to network and cluster sizes. Expression for optimal cluster sizes to reduce the size of routing tables and the routing overhead are also derived by the authors. Xianren et al. propose a theoretical framework for computing the overhead of proactive routing protocols for MANETs . The authors conclude that the overhead of the routing protocols rises with an increase in the node mobility. Sadagopan et al. developed a mathematical model to calculate the energy cost associated with a WSN query protocol called ACQUIRE. The authors also proposed similar models for Expanding Ring Search (ERS) and Flooding-Based Queries (FBQs) for mutual comparison. Heusse et al. theoretically analyzed the performance anomaly of 802.11b  by deriving expressions for throughput, probability of collision, and contention time. The authors show that, when some of the hosts communicate at lower bit rate, the performance of entire network degrades significantly. Jacquet and Laouiti  compare the performance of proactive routing protocols with flooding-based routing mechanisms through simulations and the modeling of control overheads. However, it does not provide the final analytical result and switches to simulation analysis. We proposed a performance evaluation framework for Bio-inspired ad hoc routing algorithms in . However, the framework is only applicable to small-sized networks and does not cater for packet loss due to channel errors and collisions at the MAC layer. One of the prominent analytical studies is done by Bettstetter  in which a random graph model of ad hoc network topology is proposed. This model provides the node transmission radius, , that ensures a -connected network for a given node density. We use Bettstetter's analysis as a foundation for the work reported in this paper. We consider a dense ad hoc network of nodes which are distributed on a two-dimensional plane using a homogeneous Poisson distribution with node density . The resultant graph is assumed to be connected and all links (or edges) are symmetric. We assume an ad hoc network with a CSMA/CA-based MAC-layer protocol for contention resolution. Even in the case of no contention, we account for the possibility that a packet may be lost due to channel errors (such as interference, fading, etc.). For simplicity, we assume that the network topology does not change during a route discovery process. This assumption is realistic because timescale of mobility is much smaller than the timescale of a single route discovery. The routes may, however, change considerably from one route discovery to another. Similarly, we assume that the channel conditions do not change considerably during an RREQ transmission between two nodes. Finally, we assume that the nodes can transmit at a single uniform rate only. An ad hoc network is modeled as an undirected graph, , where is a set of nodes and is a set of wireless links. A link between any two nodes exists if they lie within the transmission radius of each other. However, due to channel errors and contention, presence of a link between the neighboring nodes does not necessarily guarantee packets delivery in either direction. A graph is connected if at least a single path exists between each pair of nodes; otherwise, it is a disconnected graph. A graph is said to be -edge connected if and only if -edge-disjoint paths exist between each pair of nodes. is the degree of a node and it refers to the number of nodes directly connected with . A node is said to be an isolated node if it has a zero degree. Equations (2) and (3) can be used to build the topology of an ad hoc network with given parameters. For instance, if we set m in a network of nodes deployed in an area of , the network will be connected with probability. We now provide formal definitions of routing overhead and route optimality that are used in this paper. Routing overhead of a reactive protocol is the total number of control packets launched in the network by the protocol in response to a route request (RREQ) message up to an arbitrary number of hops from the source node. Optimal route is a protocol-dependent term in which optimality may be defined in terms of the number of hops, energy, reliability, latency, and so forth. We use the most common and widely-used definition [2, 4]. An optimal route is a route of minimum hop length. Nodes in ad hoc routing algorithms may forward RREQs stochastically. Additionally, the forwarded RREQs in these protocols may collide or get lost due to channel errors or dynamic topology. Therefore, we need to cater for not only the lost RREQs in the next hop calculations but also the stochastic forwarding behavior of nodes. For this purpose, we introduce a generic parameter, known as broadcast forwarding probability, defined as follows. Broadcast forwarding probability is the probability that a node will forward an RREQ message to its neighbors and the message will be successfully delivered to them. Expected forward degree is relevant for understanding routing overhead model. Consider node (Figure 1) which has just received an RREQ and it decides to forward the RREQ to its neighbors. RREQ broadcast by node will be received by its neighbors located in ring and within the transmission circle of . Now we must count those neighbors of which are likely to forward this RREQ. In general, a neighbor drops a new RREQ if it already received the RREQ packet through other wireless links. Otherwise, it can decide to forward it with probability . The neighbors of in ring that are expected to forward that RREQ define the forward degree of node . Illustration of the forward degree of a node. Expected forward degree of a node is the average (or mean) number of neighbors of that node which forward a received RREQ with probability . We represent the expected forward degree of nodes at hops from the source node as (see Table 1 for the description of modeling variables). In an attempt to quickly discover a route, reactive protocols completely or partially flood RREQs in a network. Tracking this flooding pattern is complicated because, depending on the routing scheme being used, the intermediate nodes may or may not forward the RREQs . In this section, we first model the routing overhead of reactive routing protocols as a function of expected forward degree which is later extended to proactive routing algorithms as well. See Appendix A for the derivation of (5). Equation (5) shows that is directly related to the number of hops traversed by an RREQ, probability , and the expected forward degree of nodes. It can be intuitively validated as well. For instance, pure flooding algorithms have higher routing overhead because . Similarly, the routing overhead increases with an increase in path length between a given pair. Equation (5) provides an interesting insight that the RREQ storm exponentially decreases with an increase in the path length. As a result, a distant destination may not even receive RREQ and subsequently no path is discovered. Now the routing overhead model (5) contains three unknown parameters: expected forward degree ( ), probability of no collision ( ), and the probability of no channel error loss ( ). The following three subsections model these three parameters. Forward degree of a node depends upon its relative position from the broadcasting node. Generally speaking, the neighbors located at a longer distance from the broadcasting node have higher forward degree. For instance, node (Figure 1) can reach more new nodes than node and therefore has a higher forward degree. Due to significant variance in the values of forward degrees, we derive expressions for an expected or mean forward degree of a node relative to its distance in terms of hops from the source. Ideally, in the case of no channel error and contention, RREQ of node (Figure 1) is received by all of the neighbors located within its transmission range. Broadcast of the neighbors of node is received by nodes within radius of these neighbors where . Note that is a function of node density and for dense ad hoc networks. Therefore, for the presently-considered dense ad hoc network, the total number of new nodes that will hear the broadcast of the neighbors of is approximately , that is, nodes within ring I shown in Figure 1. Note that the word new is used to factor out the other nodes which have already received RREQ from the source node. This is necessary to incorporate the behavior of most ad hoc routing protocols in which nodes do not forward duplicate RREQs. Hence, the expected forward degree of 1-hop neighbors is . where . Remember that in (6) represents the number of hops from the source node up to which we want to calculate the routing overhead. For protocols that flood the RREQs in the entire network, for example, AODV-LL, where is the diameter of the region measured in terms of hops. 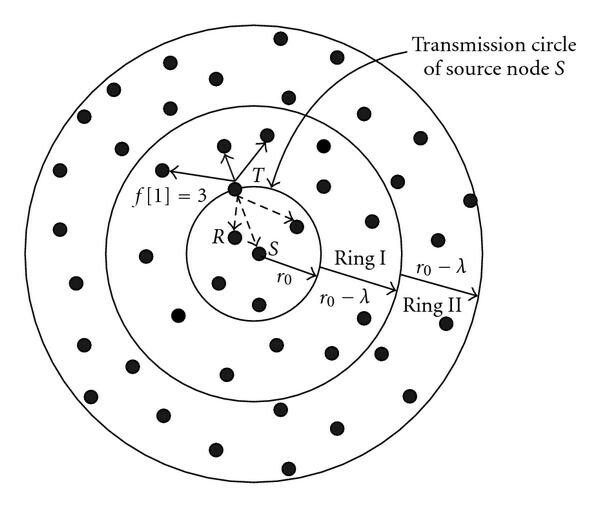 Equation (6) models a pure flooding protocol because we assume that broadcast of nodes within an inner region (e.g., ring I in Figure 1) is heard in the entire outer region (ring II). In stochastic broadcasting protocols, however, we need to factor out those nodes that do not forward RREQ. With reduction in the number of forwarding nodes, potential receivers reduce proportionally in the outer ring. Therefore, we expect that the expected forward degree will still be the same because it is the ratio of nodes in the two rings. The expected forward degree of nodes decreases with an increase in the number of hops (i.e., ). This is because of an increase in the number of potential forwarding nodes as the RREQ storm sways across a continuously decreasing uncovered area. 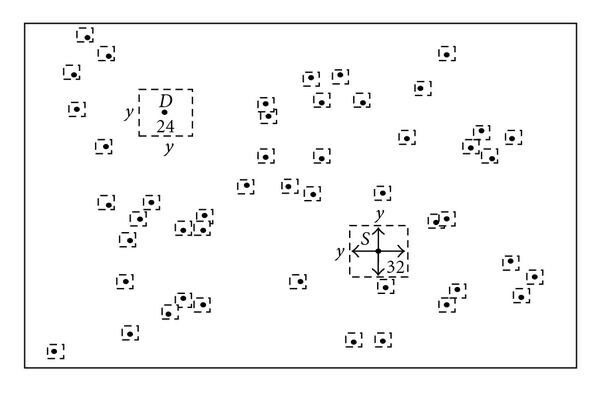 We also emphasize that RREQ storm in real networks would not follow perfect ring styles as depicted in Figure 1. Consequently, the routing overhead estimated by our model may be slightly higher than actual. A similar argument holds for sparse networks (or the cases where is significantly smaller) where . where 31 as defined in 802.11b standard) is the minimum contention window and is the number of competing nodes. Higher is the average degree of a node and lower is the value of . where 20  s for 802.11b standard) is the duration of each wait slot. For a given network, all variables in (8) are constants ( ), and hence a node experiences a constant delay in order to get access to the channel for transmission of an RREQ. We now briefly describe two prominent approaches that translate a channel model into the packet error probability . These two approaches, respectively, involve physical- and MAC-layer channel models. where is the standard error function, is the distance between the two nodes, and is the lowest threshold attenuation which is required to deliver a packet between the nodes. Probability of no channel error is then . where is the steady-state probability of Markov state . Interested readers are referred to [22, 23] for further details of Markov models of residual MAC-layer channels. In the following subsections, we discuss different optimizations to blind flooding of RREQs and the way they can be modeled using (11). Blind flooding of RREQs in the entire network may lead to broadcast storm problem . Therefore, on-demand ad hoc routing protocols use a number of optimizations to this basic scheme. In the following subsections, we mention the most common optimizations that can easily be modeled using (11). This is one of the well-known methods in which source nodes set a value in the broadcast RREQ indicating the number of hops it can travel. If , the receiving node(s) repeat the broadcast after decrementing the value. Equation (11) provides a straightforward implementation of this process in which represents the size of a ring. To illustrate further, we provide an expression for Dynamic MANET On-demand (DYMO) routing protocol  in Section 6 that uses an expanding ring search mechanism for the route discovery. In this optimization, nodes forward RREQs with a certain probability which may or may not vary with the hop distance. A number of variants of this approach are reported in . In its most basic form, each node—irrespective of its distance from the source node—broadcasts RREQ with probability . In other variations, the value of varies for different nodes. For instance, the nodes within a radius of hops are allowed to broadcast unconditionally, that is, while the rest do it with . Equation (11) can easily be adapted to any of these flooding patterns. To elaborate the transformation process, we adapt the generic routing overhead model to GOSSIP1 protocol  in Section 4.3 that uses stochastic flooding of RREQs. The optimizations techniques mentioned above may even be combined to further optimize the flooding process. For instance, ring search may be combined with stochastic flooding. It should now be evident that the proposed routing overhead model is able to handle such a hybrid case as transparently as the rest of the optimizations techniques. In the following two subsections, we adapt the generic routing overhead model to four ad hoc routing algorithms: AODV-LL, DSR, Gossiping, and DSDV. Finally, we present a comparison of the results of routing overhead models of the four protocols with the ones obtained through simulations. DSR  is an on-demand multipath ad hoc routing protocol with two main components: route discovery and route maintenance. During route discovery, source node broadcasts an RREQ packet to all its neighbors. Intermediate nodes keep rebroadcasting RREQs unconditionally (i.e., with ) unless they reache the destination which responds with a route reply (RREP). If an active route is available at an intermediate node, it also responds with an RREP. Route error (RERR) messages are used to inform the source node that the current route is broken. AODV-LL [4, 8] route discovery mechanism is similar to that of DSR, and hence routing overhead model of DSR also applies to AODV-LL. is the limiting factor in (12) that reduces the effective routing overhead. Note that the collided RREQs waste limited network resources like battery, bandwidth, and so forth, without contributing towards the route discovery process. DSDV  is a proactive routing protocol in which each node maintains a next hop lying on the shortest path for all of the reachable destinations in its routing table. In addition, it also stores its estimate of distance for reaching the destination. A node periodically exchanges its distance vector routing tables with its neighbors. The loops are avoided by using sequence numbers in the exchanged messages. where is the total time of an experiment. has mostly constant parameters with the exception of that can vary with changing topologies. As a result, the routing overhead of DSDV approximately remains constant with little variation under dynamic conditions . Optimized Link State Routing Protocol version 2 (OLSRv2)  is another popular MANET routing protocol which performs restrictive flooding of Topology Control (TC) messages in a proactive manner. Speaking more specifically, OLSRv2 only allows specific nodes—called Multipoint Relays (MPRs)—to forward TC messages. Therefore, to model the routing overhead of OLSRv2, we have to combine (11) and (13). In this case, will represent the probability that a given node is an MPR. In Gossip-based routing algorithms, each intermediate node rebroadcasts RREQ with a probability , a technique termed as GOSSIP1( ) in . The approach can be used to optimize a pure flooding protocol. For instance, BeeSensor, proposed in , uses this technique to reduce the routing overhead. A number of variants of this basic approach are proposed in . We only model a purely stochastic rebroadcasting approach in order to compare its routing overhead and route optimality characteristics with a plain flooding approach. Equations (12) and (14) only differ by the values of probabilities. The product in (14) is always less than irrespective of the individual values of and . As a result, . But the lower value of the product can significantly degrade the route optimality characteristics of GOSSIP1 as described in Section 5. We used a number of assumptions to simplify our routing overhead model, and therefore, we must compare the results of our model with the simulation results. In addition, we also evaluate the routing overhead model of DSR (12) in an ideal lossless channel . In this scenario, routing overhead of DSR generated by a source node should converge to the size of the network because no RREQs are lost. In a network of nodes deployed in an area of m , each with a transmission radius of m, our model estimated RREQs, which is in complete agreement with the expected results (see Table 2). Routing overhead: Simulation results reported by Broch et al. versus the analytical results. We used an impartial methodology for comparing the results of our model with the simulation results reported by the independent researchers (i.e., Broch et al. ). We generated the network topology as reported by the authors of , that is, 50 nodes randomly placed in an area of m 300 m. We used (3) to calculate the transmission radius of each node which equals m. The simulation results  for -second pause time (in 30-source scenario) and the corresponding formal model results are tabulated in Table 2. One can see in Table 2 that the routing overhead estimated by our model is % less than that of DSR compared with NS-2 results. Keeping in view of the fact that we do not count the RERR messages nor the replies generated in response to an RREQ, difference between the estimated routing overhead and the simulation results (AODV-LL and DSR) is acceptable. The reason for the matching results is due to slight overestimation of the number of RREQs generated in a route discovery which indirectly balances the exclusion of RREPs, RERRs, or HELLOs. It should also be noted that we are counting the routing overhead generated in a single route discovery attempt. This also contributes to the difference between the simulation and the analytical results. We also repeated the same experiment for DSDV by assuming ( , ) with results depicted in Table 2. Difference of in the estimated result over seconds is acceptable if we consider the dynamic nature of wireless medium in ad hoc networks. Finally, we point out that the -order approximations (average values) used in the paper also lead to discrepancies between simulation and analytical results. We also repeated the NS-2 experiments using the parameters reported in  to further elaborate the performance of routing overhead model. We disabled retries as our model only estimates the RREQs generated during a single route discovery. The results of these experiments are shown in the last row of Table 2. Now the results of the proposed model are extremely close to the simulation results. As expected, the model shows slightly higher routing overhead (see Section 4.1.1 for the reasons). Before we move on to route optimality models, we would like to emphasize some other applications of the generic routing overhead model given by (11). While computing the routing overhead of ad hoc routing protocols, we in fact modeled a generic flooding pattern that is found in a variety of MANETs as well as WSN routing & data dissemination protocols. Our model estimates the number of nodes that may receive such a broadcast packet and are likely to repeat it after reception. Consequently, we are not only computing the total number of transmissions in the network but also computing the number of nodes that will receive such a broadcast successfully. This in turn is a measure of the network coverage which is an extremely important parameter in ad hoc networks. Equation (15) shows that, as a node distance (in hops) from the source gets higher, the probability that it will receive the packet reduces exponentially. Therefore, even if all nodes in the network take part in the broadcast process, it cannot ensure that the broadcast will cover the entire network. We now introduce our generic route optimality model for ad hoc routing protocols. In a typical ad hoc routing algorithm, for example, DSR, intermediate nodes do not forward duplicate RREQs, and hence a node can be a part of single route only. Consequently, such ad hoc routing protocols only discover node-disjoint paths. Consider the network shown in Figure 2 in which source node floods an RREQ for destination . Each intermediate node broadcasts a copy of RREQ until it reaches the destination. Now destination may potentially receive as many RREQs as the number of its neighbors. In case of source routing protocols, RREQ builds a source routing header of the path followed by it. We have shown a copy of such RREQ received at in Figure 2. Now the question is as follows: is it possible that a node may be present in the source routing headers of more than one RREQs received at ? The answer is no because the presence of a node in multiple RREQs means that the node has rebroadcast multiple copies of identical RREQs, which is not possible. Therefore, a node can only be a part of single route only supporting the argument that ad hoc routing protocols based on simple flooding can discover node-disjoint paths only. Route discovery in an ad hoc network: source node broadcasts an RREQ which is flooded in the entire network. We assume that there are -node-disjoint paths between a given pair with an optimal path length of hops. We do not assume a fixed distribution of available paths. Rather, a function provides the total number of node-disjoint paths of length between a given pair. For instance, if there exist node-disjoint optimal paths of length and node-disjoint paths of length between the source and the destination, then and . where is the probability of discovering an optimal path and is the number of tries to discover a link. Derivation of (16) is given in Appendix B. The term in (16) is the probability that a routing algorithm fails to discover an optimal path in one attempt. We can minimize this probability either by increasing the number of optimal paths ( ) or by increasing . This is easier said than done. For instance, increasing by having a higher node density will increase the collision probability that results in decreasing the . Note that the limiting case of results in a zero failure probability. We address this problem separately for single and multipath ad hoc routing algorithms. where , provide the total number of available node-disjoint paths of length and hops, respectively. In (17) as , the probability of finding -suboptimal route approaches to zero. Therefore, suboptimal paths are less probable as compared to optimal paths. A simple comparison of (17) and (18) shows that the probability of discovering -suboptimal paths in multipath routing protocols is greater than in single-path routing protocols. Expected or marginal probability refers to the probability of discovering a path irrespective of the route length. It is important for two reasons: ( ) ad hoc routing protocols are not always guaranteed to discover paths especially the ones that use stochastic rebroadcasting of RREQs and ( ) expected probability of path establishment also provides us with an estimated path length that is discovered by a protocol. We again address this problem separately for the two classes of algorithms. where is the normalized weight of the paths of length . Expected probability is a weighted average of all individual probabilities. As weights are dependent upon the number of available paths ( ) of a particular length, expected probability degrades if the paths are evenly distributed. A higher value of expected probability can result in discovery of more optimal paths. A comparison of (19) and (20) shows that the multipath ad hoc routing algorithm has significantly higher probability of a route discovery as compared to single-path algorithms (see Figure 3(a) in which DSR has higher optimal path routing probability than AODV-LL). A comparison of route optimality models with simulation resultsPacket routing probability through optimal/suboptimal paths [ 8 ]Optimal/suboptimal path discovery probabilities: analytical results. Intermediate nodes in both protocols forward the RREQs only once with in a route discovery process. Therefore, putting and in (19) and (20) gives expressions for marginal probability of path establishment for AODV-LL and DSR, respectively. We do not reproduce these equations here for brevity. An interesting observation is that is a generic term that models both pure flooding and stochastic protocols in the same way. Therefore, both types of protocols will fail to discover a destination located beyond a certain hop length. DSDV proactively maintains the shortest path to each possible destination. Each node in the network tries to discover a link with all its neighbors times in a given run of the experiment. Therefore, putting and in (19) gives the expected probability of route establishment for DSDV protocol. Note that the term increases the probability of optimal route discovery in DSDV. Consequently, the probability of discovering suboptimal paths is substantially reduced (see Figure 3(b)). Gossiping is a strategy to control the flooding of RREQs. Therefore, it can be modeled both as single-path and multipath routing protocol. In this model, we assume it to be a single path routing protocol in which the nodes forward only once the RREQs with probability in a route discovery process. Therefore, (19) can be modified for GOSSIP1( ) by inserting and . We assume in this model that even the source broadcasts an RREQ with probability . The case in which source broadcasts an RREQ with probability can be incorporated in (19) by putting . Since three probabilities in GOSSIP1( ) are multiplied, that is, , therefore, the resulting probability is lower than the minimum value. If any one of , or is small (e.g., ), it will result in quick decaying of the broadcast storm. Consequently, a destination that is only fewer hops away from the source will not be discovered by the RREQs. It is therefore recommended that selection of rebroadcasting probability must be set carefully in order to make sure that RREQs are able to reach the farthest node in the network. Before we conclude this section, we point out that, although the adaptation process is elaborated for the expected route discovery probability models, generic models of optimal and suboptimal route discovery probabilities can also be adapted to specific protocols in a similar way. The authors of  report the number of data packets routed by a protocol through optimal route, -suboptimal route, -suboptimal route, and so on. To compare the results of the proposed route optimality models with simulation studies, we computed the probabilities that a given routing protocol routes a packet through optimal or suboptimal path. For this purpose, we have divided the number of data packets delivered through each route—optimal and suboptimal—by the total number of delivered packets. We plot the computed results in Figure 3(a) for the three protocols: AODV-LL, DSR, and DSDV. We used the same topology parameters as reported in  and the results of our framework for the three protocols are shown in Figure 3(b). We assume , , and an exponential paths distribution, that is, and so on. The bar graphs of simulation results and analytical results shown in Figure 3 have approximately similar trends. Each protocol has higher optimal path probability while suboptimal paths are rarely discovered or used. The deviation from simulation results is expected due to our simplifying assumptions. A noticeable discrepancy in the analytical results is the longer tail of DSR. Recall that DSR route optimality model is based on the assumption of maintaining all available paths. Therefore, the probability of suboptimal paths discovery is independent of the number of optimal paths. However, implementation usually maintains a subset of the total available paths in which preference is given to the optimal paths. Consequently, suboptimal paths discovery probabilities decrease at a faster rate. where is the Euclidean distance between a given pair of nodes and is the initial ring size. Keeping as a variable parameter will allow us to study the impact of different values of on the routing overhead. 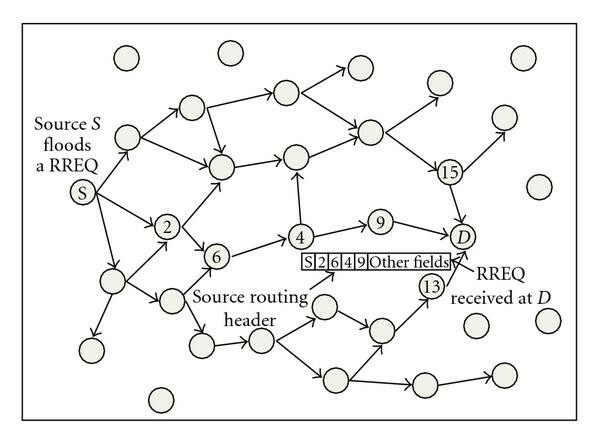 Consider the network shown in Figure 4 consisting of nodes deployed randomly in an area of m 500 m. The square around a node represents the area in which the node is allowed to move between two consecutive route discoveries. We simulate the movement of nodes by assuming a Poissonian RREQ generation pattern. Assuming squares of varying dimensions, we simulate different mobility patterns. We then performed experiments with different network topologies— , , and nodes—and different values of . We report the total and the average routing overhead generated by a pair of nodes in Table 3. Routing overhead of DYMO under mobility. Example illustration of mobile scenarios. It can easily be noticed that the number of RREQs generated under high-mobility conditions is comparatively higher. Second important point to note is that the initial ring size has significant impact on the routing overhead. For instance, produces the least routing overhead in all assumed scenarios. We also notice that too low values of —in larger networks—can almost nullify the impact of ring search method. Consider a case in which a pair of nodes are separated by a distance of hops. If the source node starts a route discovery process with , it will have to launch repeated route discoveries by incrementing on every new attempt. Consequently, it will generate significantly higher routing overhead. On the other hand, if the source starts with , the number of attempts will be smaller. This clearly leads to an important conclusion that should not be a constant value. Rather it should be set dynamically in accordance with node topology because the value of is critically important to minimize routing overhead. 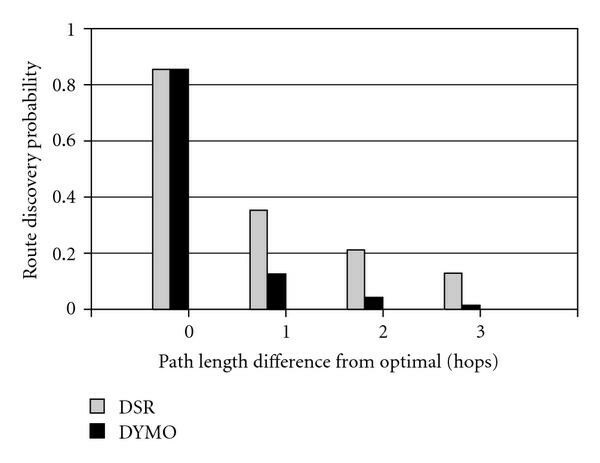 We have also computed the route optimality of DYMO and DSR protocol and the results are shown in Figure 5. These results are consistent with the simulation results shown in Figure 3 where the probability of optimal path discovery is significantly higher as compared to suboptimal paths. It then decays rapidly as the path length is increased. Route optimality of DYMO in mobile scenarios. Route optimality and control overhead are the baseline metrics that can be used to derive a number of other metrics. As a proof of concept, in this section, we derive expressions for two additional metrics commonly reported for ad hoc routing protocols: energy consumption and route discovery latency. We use the symbols in Table 1 for the following derivations. Transmission and reception of packets (control and data) are the major sources of battery depletion in mobile devices. We, therefore, derive expression for energy consumed during these two processes. Now the total energy consumed by a protocol is the sum of energy consumed during route discovery and data transmission phases. An interesting point to note in (22) is that majority of energy consumed in a route discovery process is due to the reception of broadcast traffic which is approximately double the energy consumed for transmitting RREQs. We ignore the transmission and propagation delays because of their dependence on technology but they can be embedded in (23). For a particular device type, the latency of route discovery is directly dependent on the path length. Higher the path length, more nodes contend for the channel access that lead to a higher latency for discovering routes. In this paper, we proposed a formal framework to accurately model key performance metrics of ad hoc routing algorithms. We adapted the generic models to specific ad hoc routing algorithms, namely, AODV-LL, DSR, GOSSIP1 and DSDV. We show that, in addition to time-efficient, accurate, consistent, and repeatable performance evaluation of ad hoc protocols, the proposed modeling framework provides interesting insights into the impact of parameters on behavior of these protocols. Hence, we advocate the use of mathematical evaluation techniques for ad hoc routing algorithms because they are time efficient, accurate, unbiased, consistent, and scalable. In future, we will extend the proposed evaluation framework in order to model other relevant metrics, for example, packet delivery ratio, packet latency, and so forth. In addition to this, we also intend to make the framework more generic so that other emerging and prominent ad hoc routing protocols can be modeled and evaluated using different traffic patterns. This work was supported in part by Higher Education Commission (HEC) of Pakistan under Indigenous 300 scholarship scheme. The authors are also grateful to the anonymous reviewers for their useful comments which helped them to improve the quality of this work. where represent the expected forward degree of nodes at hops from the source node, respectively. Also notice the last that is subtracted from the sum of all terms. This indicates that the destination node does not participate in rebroadcast. Equation (5) is the concise form of (A.1). where is a random variable representing the number of optimal paths discovered successfully. Putting in (B.1) gives the probability that no optimal paths will be discovered. Hence, the probability of discovering at least one optimal path is as given in (16).